Heartbreak has to be one of the most painful things you can ever go through. Have you ever just wished you could move on from your feelings? That you would just stop thinking about that person or situation? I know I have! And many of my clients come to me struggling with this. They just want the pain to be gone. One of my personal ah ha moments was when I was thinking this same thing, “when will I be over this! I cant take it anymore!”, and then I remembered, running from the feeling never helps or works. I was trying to hide, dodge and pretend like I wasn’t hurting, like I didn’t still care. Like there was some sort of strength in being okay and not feeling. But I did care, and trying to run was only causing more internal turmoil. Leaning into and accepting our feelings is the only way through. When it comes to love, loss and heartbreak, this is not an easy thing to do. If you are no longer with someone but you still care about them and think about them, that’s okay, its normal. To love someone is a deep and beautiful thing, those feelings don’t just disappear overnight. Even if you are no longer with that person or they really hurt you, its still normal to have some lingering loving feelings. You can honor those feelings and recognize them, and then move forward with taking care of yourself. The feelings will pass over time. Or you will just get better at living with them. A few weeks ago I posted the quote “the answer is always, love more”. That is truly what I have found. Love yourself more, love those that hurt you more, love and love some more. Some of you know that I grew up Mormon and am no longer apart of that community (long story for another day!). But this scripture still lingers with me. “Love your enemies, bless them that curse you, do good to them that hate you, and pray for them which despitefully use you and persecute you”. It was one of my favorites because I saw it as the saintliest thing you could do, love those that hurt you. How do you possible love someone who is using and abusing you!? Its much more natural to want to retaliate or fight back. The problem is that just leads you into more pain and suffering. In the end if you want to be free and move on, the answer is actually through love, forgiveness and compassion. For yourself and for them. Now this doesn’t mean we should put up with abuse. If you are in a bad relationship you should not stay and constantly turn the other cheek. You may need to cut ties and move forward with your life without them. Then do you look back on them with hate and anger? Or love and sorrow? Hate and anger is likely much more natural! I like the way the Dalai Lama talks about this when he says that we can look back and feel sorry for those that hurt us and the pain they are causing to themselves and others. If someone is causing that much pain then the internal suffering they are or will face is tremendous. We can work (its not easy) to look at them with compassion and love. But that does not mean we should stay in their line of fire. The angry part of us wants to run and hate and the part that still loves them wants to stay and put up with it. But In this situation, the answer is not in either of those. It really is perfectly natural to want to run from these feelings after being hurt. We want to protect ourselves and we don’t want to be hurt again. There is also truth to the saying “feelings buried alive never die”. We can run and we can hide, but the feelings will manifest again in one way or another. You may not be ready to put yourself out there again, and that’s okay, there is not rush, but work to honor the feelings that you have. You’re not crazy. You’re human. Give yourself time. 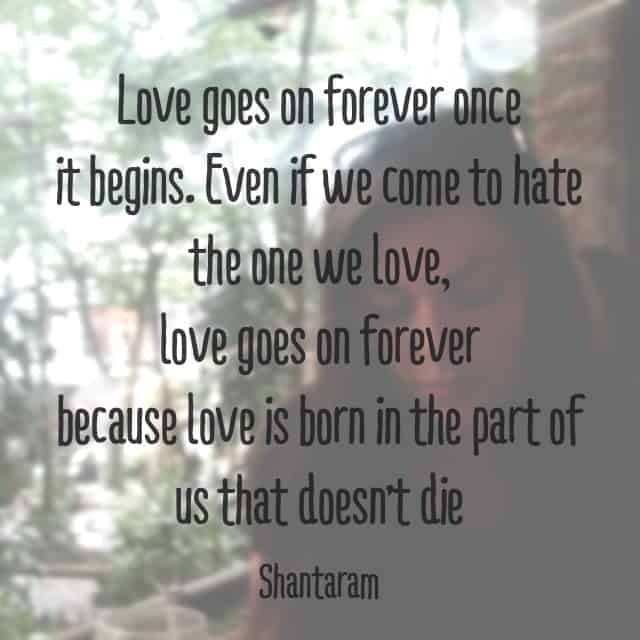 There are so many beautiful quotes from the book Shantaram and this is one of my favorites.